Our friends at Collector's weekly have a new interview. This time, Mark Bahti, the proprietor of Bahti Indian Arts based in Arizona and New Mexico talks to them about Native American jewelry. Mark graduated from the University of New Mexico and wrote the first popular book on Southwest Indian arts and crafts. In the summer of 1949, his father, Tom Bahti opened a little shop called Ghost Ranch Trading Post in Abiquiu, New Mexico. Later, he moved the shop to Tucson, Arizona. Mark and his wife Emma run the shop in Tucson and also owns another one in Santa Fe, NM. In the interview, Mark discusses the advent of silversmithing in New Mexico, as well as the importance of the early Native American tribes for the early jewelry styles. The interview is very comprehensive and moves through the very early southwest designs, including a discussion of hallmarks, through to post World War II designs. 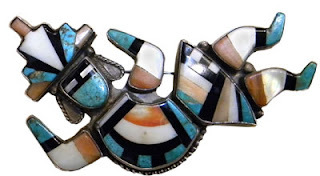 Mark also discusses the use of turquoise in Native American designs and the importance of Native American families in the various early jewelry designs. Bahti is the author of Collecting Southwestern Native American Jewelry, as well as Silver and Stone, in which he interviewed about 50 different jewelry artists. If you have a fascination with Native American jewelry, as I do, you will find the discussion with Mark very informative. You can view the whole interview on this page of the Collector's Weekly website. Thanks for the correction. I've changed the blog post slightly according to your comments. I hope that it is correct now. Interesting article, the piece looks good as well. Sharp details and very attractive color combinations.